Wow - A powerful sobering reminder of the horrors of war in general, and a stellar tribute to the bravery and spirit of the young men and women who charge forward in to it. We've all seen the old black and white war footage scratch across the screen. Remarkably, Peter Jackson and his team have done an eye-popping job of restoring that footage to real life speed, natural color and amazing three dimensions. Still, perhaps the most striking effect about this picture is the personal portraits of the soldiers themselves as young men bravely entering into the unimagined chambers of the ugliness of war. It's their story, up close and intimate. When they look at the camera, you'll feel like they're looking right at you. 95% of the visuals are footage of World War I soldiers signing up, training, leaving England, and finally at the front. WWI veterans themselves comprise the entirety of the audio track, telling their own stories (taken from over 600 hours of recordings made later in their lives). Peter Jackson (director of Lord of the Rings) bookends the film itself with interesting commentary on its origin story as well as the technical challenges and their solutions - all very very engaging. 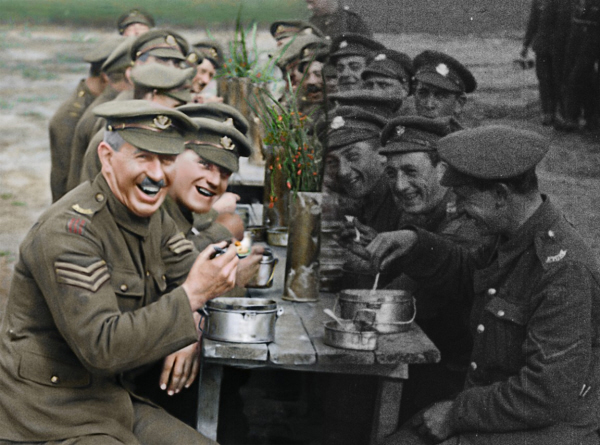 They Shall Not Grow Old . Copyright © 2019. Directed by Peter Jackson. Warner Bros. Pictures.